Before we go any further, any good guidance to purchasing reptiles will urge you to always see the animals before you buy them. Although the animals we supply are always in first class condition we heartily endorse that option - you really should see the animals first hand and select the ones you want. But, please remember, we are not a shop, we are not trader, we are not an importer. We are, simply, captive breeders. All of the animals are, at the very least, kept at our home and in some cases actually bred here. The two consequences of this are that a) we have not published our address - we do not WANT unwelcome night-time visitors helping themselves as has happened in the past and b) we have to live normal(ish) lives. Thus we will always welcome visitors BY APPOINTMENT to select animals which they wish to buy. We are based in the Worthing area and will provide details with a firm appointment to visit. 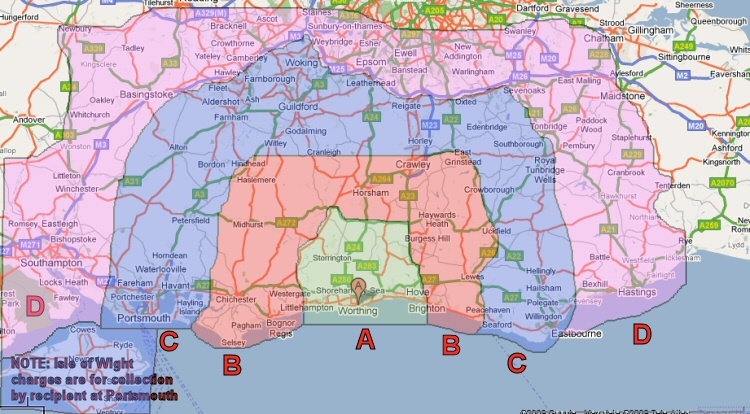 Currently we will deliver ourselves within a 50 mile radius of Worthing. Again this will be subject to our availability and it is ESSENTIAL that someone will be on hand to receive the animals. Charges in this case based on simplistic mileage bands as shown below. These charges, and the bands shown on the map below reflect largely fuel costs, and the nature of the road access is reflected in the irregular shape. PLEASE NOTE: Although the Isle of Wight is included in BAND C this is actually for delivery to meeting the recipient off the Isle of Wight Ferry at Portsmouth. Deliveries outside this area can also be arranged by courier. Again, it is ESSENTIAL that someone will be on hand to receive the animals. DUE TO A HUGE INCREASE IN TNT PRICES WE CAN NOW ONLY COURIER BY A SPECIALIST ANIMAL CARRIER (Reptilecarrier.com). WHILE THEIR SPECIALIST EXPERIENCE AND EQUIPMENT MEANS WE CAN SAFELY SEND ANIMALS WHATEVER THE CONDITIONS, DELIVERY CAN ONLY BE MADE ON THE DAYS AND TIMES THAT THEY HAVE SET FOR THEIR "RUN". PRICES ARE VARIABLE ACCORDING TO LOCATION. AS AN EXAMPLE, MANCHESTER AREA IS ABOUT £45.00. We are now able to arrange delivery to Ireland using the courier referred to above. Please contact us and we will get a quote for delivery costs. We can now usually arrange for animals to be delivered to the Hamm and Houten Reptile Shows for collection. Again, please contact us and we will get a quote for delivery costs.